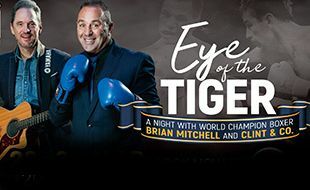 This unique tell-all story by World Boxing Champion Brian Mitchell, live on stage, up close at Barnyard! Brian is joined by the legendary Clint Cunningham and his awesome band, better known as “Clint & Co”. Brian brings you his epic stories of the blood, sweat and tears he shed across an incredible career, with loads of entertainment in between! Clint & Co brings the show to life, interlacing Brian’s stories with boxing-associated hits such as Eye of the Tiger, Simply the Best, The Boxer and loads more you will love! This show will give you a highly entertaining night out, have you laughing and singing, give you goose bumps, and left feeling inspired! Rewards discount may not be used in conjunction with other discounts. Limited to 10 tickets per show per cardholder.